You may want to rank well for ALL the generated keywords, but its best to focus all your efforts on a selected few. The idea now is to find keywords that are relatively easy to optimize and yet have a decent search volume. These would be the keywords with the least compitetion in Google. Go to Google.com and enter each of your short listed keywords (one at a time). It is best if you search for the exact phrase, so surround your keyword with double quotes. Note how many web results there are for each of the phrases. Now that you have collected the 'Number of web results' for each keyword, calculate competition ratio by divding it's 'Global search volume' by the 'Number of web results'. The keywords with the higher ratios are the easier ones to optimize. You can now start a SEO campaign for your keywords however you'll see next, it might be much wiser to start an AdWords campaign instead. 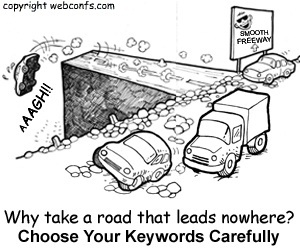 After you have picked your keywords, you need to verify if these keywords really work for you – i.e. if they convert properly. No matter how precise you've been when picking your keywords, if you don't test them in practice, you can never know for sure if they work well or don't. 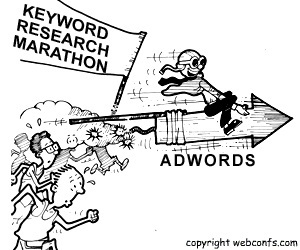 You can pick lucrative keywords with high global search volume and low levels of competition and still end nowhere. For instance, for this website - webconfs.com we could try optimizing for the keyword "Search Engine Optimization". It could take a year or so with a LOT of effort to reach the first page on Google for "Search Engine Optimization” and still one can never be sure this will happen. However, let's pretend that this happens – We manage to top Google for "Search Engine Optimization” after a year of hard SEO work. To our greatest disappointment, even the first place for "Search Engine Optimization” on Google did'nt bring the expected results because the bounce rate for this particular keyword turned out to be very high. Since we do not provide SEO Services a lot of people reaching us via "Search Engine Optimization" may NOT be getting what they're looking for. Instead, lesser popular keywords, such as "SEO Tips” or "SEO Guide” might have lower bounce rates and may actually perform better than "Search Engine Optimization” did for us. The result is not surprising but the price paid is. If we had launched an AdWords campaign, it would have saved a lot of trouble. We could have spent $20-50 on AdWords for "Search Engine Optimization” and it would have taken us a week or less to figure that the bounce rate for this keyword is very high and it makes no sense to do organic SEO for it. These $20-50 on AdWords would have spared a year of wasted SEO efforts. 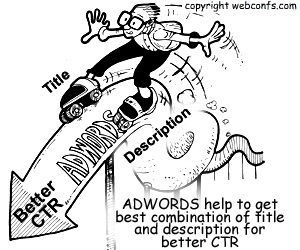 AdWords is a really valuable tool not only for advertisers. It started as a tool for advertisers but its use is not restricted to them alone. For many publishers and SEO experts AdWords is the most valuable tool because even a moderate AdWords campaign can give you valuable insights and save you a lot of time and money to optimize for words, which don't work for you.